On this date in 1940 the chief of the Ger­man high command, Field Marshal Wil­helm Kei­tel, announced that Wehr­macht troops were being dis­patched to Roma­nia “in case a war with Soviet Russia is forced upon us.” The next month Ger­man troops entered the coun­try osten­sibly to train and rebuild the Roma­nian mili­tary after King Carol II ab­di­cated in favor of his 19‑year‑old son Michael following poli­ti­cal up­heavals occasioned by a series of terri­torial dis­putes that were resolved to Roma­nia’s disadvantage. The Nazi pre­sence in Roma­nia pro­tected that coun­try’s Ploesti (Ploieşti) oil fields, which would become increas­ingly vital to the Ger­man war effort and even­tually supply more than a third of Ger­many’s oil needs. In late November 1940 Roma­nian strong­man Marshal Ion Anto­nescu ini­tialed the Axis Tri­par­tite treaty, joining Hun­gary and Slo­vakia in the mil­itary pact, not­with­standing that the leading Axis power, Ger­many, had engi­neered the whittling away of Roma­nian terri­tory to the gain of neigh­boring Hun­gary, Bul­garia, and the Soviet Union. As Hitler’s poli­tical and mili­tary tri­umphs in­creased in num­ber in the early 1940s, Anto­nescu was drawn more and more into the Ger­man orbit, supplying Ger­many not only with oil and lubri­cants but also grain, mili­tary and indus­trial pro­ducts, and more troops to the East­ern Front than all of Ger­many’s other allies com­bined. Becoming Hitler’s chief spear carrier had devas­ta­ting con­se­quences for Roma­nia. In the fighting around Stalin­grad alone (Novem­ber 1942 to Janu­ary 1943), Roma­nian losses were over 160,000 dead, wounded, missing, or captured. In the fall of 1944 a resur­gent Red Army over­ran Roma­nia and its south­ern neigh­bor Bul­garia, even­tually pulling both countries into the Soviet orbit. Roma­nian casual­ties fighting Nazi Ger­many on the Soviets’ side (August 1944 to May 1945) amounted to some 167,000 killed, wounded, or missing. The post­war Soviet occu­pa­tion of Roma­nia facil­i­tated the rise of Com­mu­nism as Roma­nia’s main poli­tical force, leading to the forced re­moval of King Michael I and the estab­lish­ment of a single-party peo­ple’s repub­lic. It also led to further ter­ri­torial losses (see second map). Escape from the Soviet orbit came in the form of the Revo­lu­tions of 1989, also known as the Fall of Com­mu­nism, which ended Soviet-backed regimes all across Central and Eastern Europe. 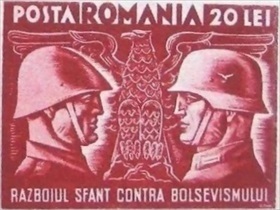 Above: Romania in 1942. The large intrusion into the middle of Roma­nia repre­sents that portion of North­ern Tran­syl­vania that was awarded to Hun­gary by Ger­many and Italy in the Second Vienna Award, August 30, 1940. Left: On June 10, 1941, less than two weeks before un­leashing Opera­tion Bar­ba­rossa on the Soviet Union, Hitler con­ferred with Roma­nian leader Gen. Ion Anto­nescu. 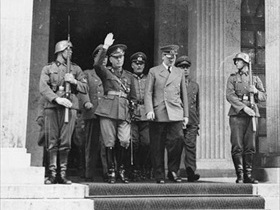 As the two national leaders exit the Fuehrer­bau, where the Munich Agree­ment was signed in Septem­ber 1938, they are followed by Field Marshal Wil­helm Kei­tel and to his left Ger­man Foreign Minister Joachim von Ribbentrop. 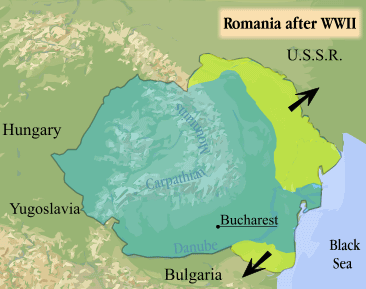 Above: Postwar Romania, 1947, showing the terri­torial losses to the Soviet Union and Bul­garia. 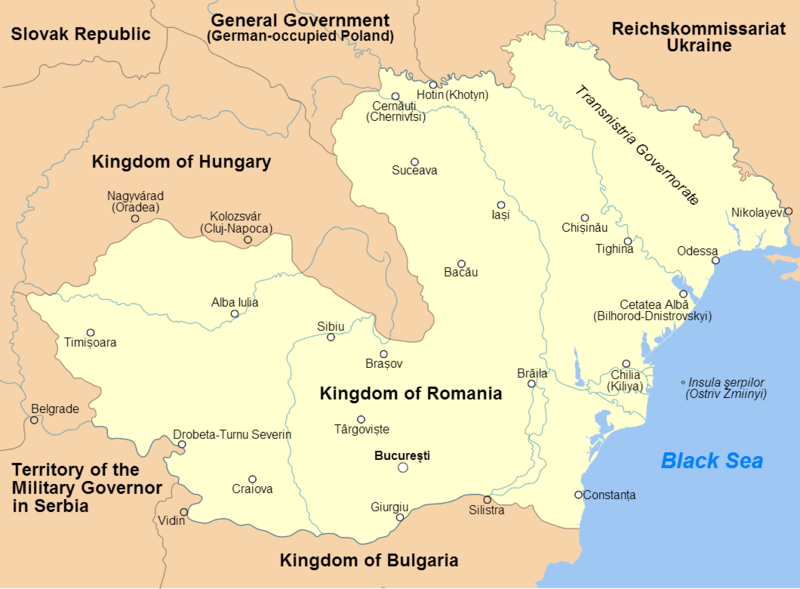 On the other hand, North­ern Tran­syl­vania, which had been lost to Hungary in 1940 (see earlier map), was once again recog­nized as an integral part of Romania.